Before you jump straight to the recipe, I’ll hope you take a moment to fill out my annual reader survey. Last year was a great success and I learned so much about what kind of recipes + posts that you were looking for. This year I’ve got a few different questions and I’m hoping you’ll spend 5 minutes to give me a little info and your thoughts on all things AK. I appreciate it more that you know! You can find the survey here. 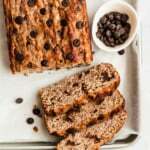 After you’ve finished filling out the survey, be sure to come back because this paleo banana bread recipe will be patiently waiting for you. I spent a week testing this recipe with various amounts of almond and coconut flour (one of my fav flour combos) before I created the version before you today. It’s my new favorite treat because it just so happens to be moist, sweet, flavorful and chocolatey. The best part is that there’s NO SUGAR added (besides the chocolate chunks). The bananas add the perfect amount of sweetness, and when paired with the melty pools of dark chocolate it becomes a banana bread dream come true. My favorite way to serve this is warm, when the chocolate is still melted. Tony actually prefers them cold out of the fridge, so it’s up to you how to enjoy them. I do highly recommend sprinkling them with sea salt. Sounds odd, but it’s addicting. 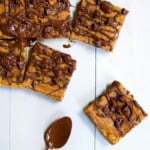 I hope you enjoy these chocolate-packed paleo banana bread bars. If you make them, be sure to leave a comment below! I’d also love if you uploaded a pic to Instagram and tagged #ambitiouskitchen so I can see your creation! xo. FILL OUT THE AMBITIOUS KITCHEN ANNUAL READER SURVEY HERE. Here’s a little video on how to make this recipe — hope you love it! 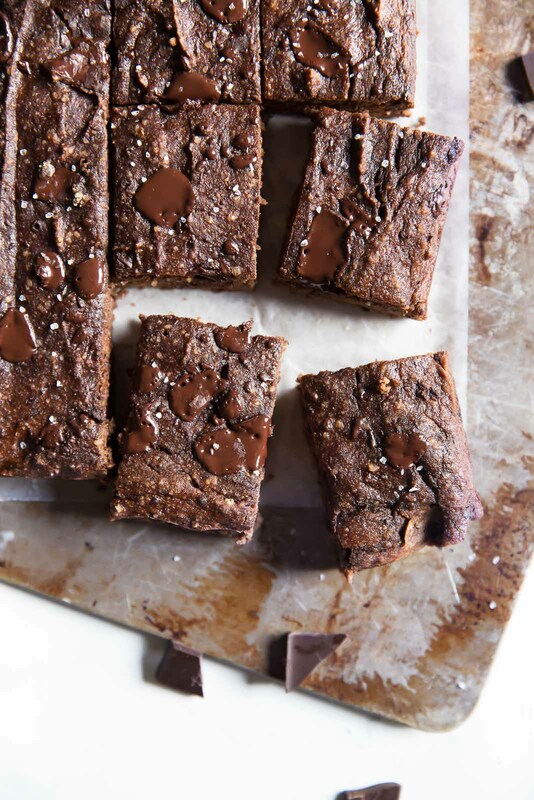 Incredible double chocolate paleo banana bread bars made with almond and coconut flour. This no sugar added treat only takes 30 minutes from start to finish and tastes AMAZING! Preheat oven to 350 degrees F. Spray an 8x8 inch baking pan with nonstick cooking spray and set aside. Add bananas, eggs and vanilla to a blender and blend until smooth. In a large bowl, whisk together almond flour, coconut flour, cocoa powder, baking soda, baking powder and salt. Gently fold in wet mixture and stir until well combined. Next stir in chocolate chunks, reserving a few tablespoons. 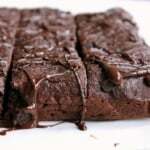 Spread batter evenly into prepared pan and sprinkle remaining chocolate chunks on top. Bake for 18-25 minutes or until toothpick comes out clean. Once done baking, transfer pan to a wire rack to cool for 20 minutes before cutting into 12 bars. To make vegan: Instead eggs, replace with flax eggs. Also make sure to use a vegan chocolate bar. Feel free to substitute 1/2 cup of dark chocolate chips in place of the dark chocolate bar. I often use the Enjoy Life brand. I often use Trader Joe's Cocoa powder, but Ghriradelli's Unsweetened Cocoa powder is nice too. Another favorite is Dagoba's organic cacao powder. If you use cacao powder, only use 1/3 cup. 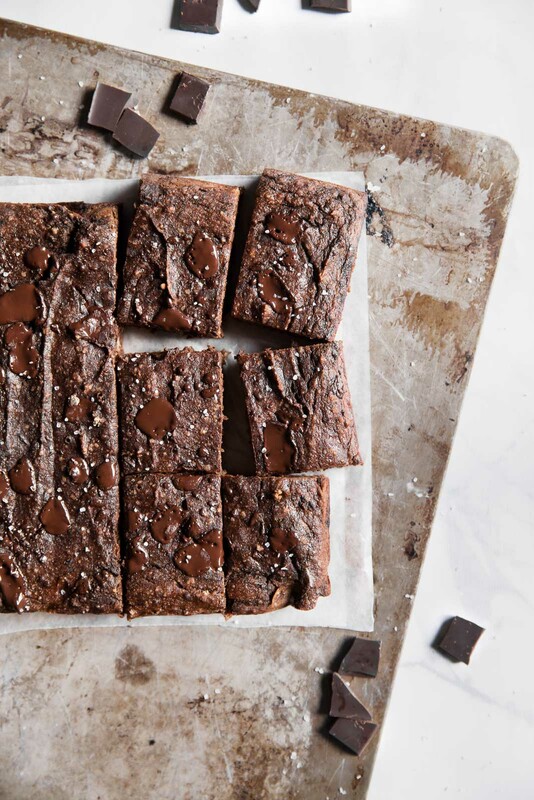 93 Responses to "Double Chocolate Paleo Banana Bread"
Chocolate + Salt = the best! I can’t believe there is no sugar! It blows my mind because this banana bread looks amazing! Okay those look seriously yummy! What a perfect recipe for a Monday morning! I am seriously excited to try these. Can I use defrosted bananas? When my bananas are on the edge I whip them into the freezer. Then pull them out to bake with when I am ready. Happily completed the reader survey! Is it regular almond and coconut flour? Or non fat? I’ve never heard of non-fat almond flour or coconut flour, so please just use regular. Everything about this recipe makes me want to eat my computer. Specially dat sea salt. No, unfortunately that will not work; you cannot exchange flours 1:1 because they have different absorbency rates. 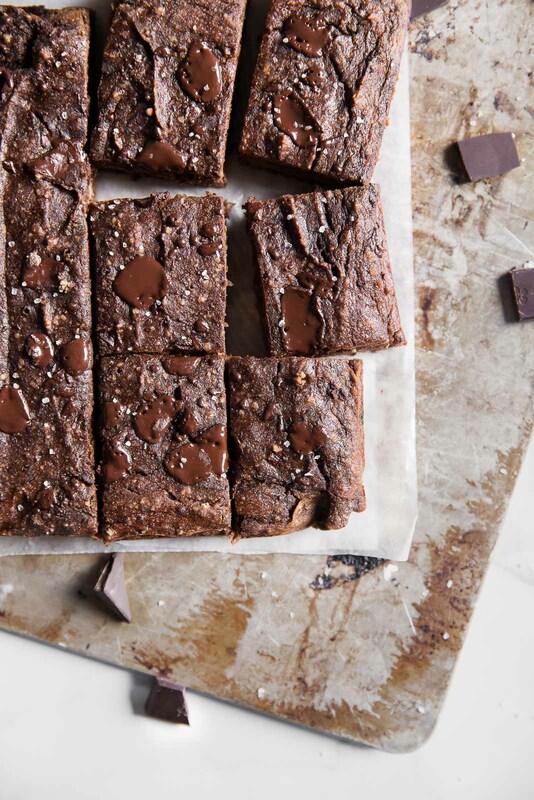 As a massive lover of the chocolate chip coconut flour banana bread ( I make it at least once a week.. sorry not sorry ) I will definitely be giving these a go! I am a HUGE coconut flour, banana, chocolate chip and almond fanatic! You had me at everything here! I am also more than happy to take the survey. So glad to be part of the AK community! Hi Sean! It says about in the recipe that you’ll need 4 medium ripe bananas. Would these still be sweet enough without the added chocolate bar? These look yummy! Would flax egg work or applesauce for substituting for the eggs? Can I sub oat flour for the coconut flour? I made these tonight for my boyfriend… He couldn’t believe there was no sugar in them (and ate several, because you know they’re healthy and all lol)! Thanks for all of the amazing recipes, I am always anxious to see what you post next! 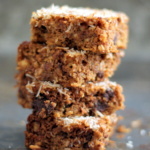 I just made these and I must say my expectations weren’t particularly high as I’ve made plenty of healthier treats involving coconut flour that just don’t work, and also the idea of rich chocolate bars meshed with banana bread, without sweetener. But, they are amazing!!! I used 1/2 c oat flour and 1/4 wholewheat a flour instead of the almond meal – glad it worked as I don’t often have almond meal on hand and it’s a cheaper option and provides some quality high fibre whole grains. I’m enjoying them warm from the oven with a cold glass of milk. So moreish! Love the melty chocolate bits. Thanks Monique! 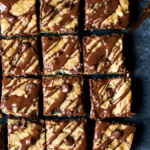 Hi, I have a question regarding the flour and cocoa measurements. Since the weight isn’t listed, would you mind providing your method of measuring? Are you using the “spoon in cup/level” method or do you “dip/level”? Or, if you know the ounces that would be even better. Makes a big difference and I want to be sure the recipe turns out the way it’s intended. Thanks so much! Hi Monique. My daughter is allergic to almond and coconut. Can you suggest another flour I can use instead? Oat? Whole wheat? This is the second recipes of yours I have made (I made the pumpkin pie) and I love these! (I loved the pie too!) I am trying to make more desserts with no “extra” added sugar and these are perfect! They are excellent the next day, just like fudge! And I love the taste of banana! Just a suggestion as I see a comment above asking this as well: measuring out ingredients by grams and providing the number of grams for an ingredient is helpful in addition to the basic cup measurements as the weighted measurements are more accurate. Also, I love that you provide nutrition info for every recipe. I “count my macros” or try and hit a certain number of carbs, proteins, and fats per day and your posting of this helps so much! So happy you liked this one! Thanks for leaving a comment! These look amazing! I would also like to know if the eggs can be subbed out due to egg allergy, flax egg or egg replacer? Hi Cheri, I haven’t tried that so I’m not positive. I wouldn’t recommend it as coconut flour tends to need eggs. Could I use something else instead of coconut flour? I just spent a ton at the market and don’t have enough for anything else right now. Can I change this up and use zucchini instead of banana, if so what quantity of zucchini. Same with pumpkin, amount to substitute for banana. Great question. I haven’t tested it any other way than listed above. I would assume the pumpkin would work okay as a 1:1 substitute, however, I can’t be sure about the zucchini. Also, please note that if you sub pumpkin, they won’t be as sweet since there isn’t any added sugar. I would recommend adding in some more chocolate chips! 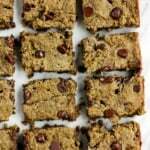 I made these last night with flax eggs (2 Tbsp. ground flaxseed and 6 Tbsp of warm water), and they turned out great. Delicious, too! Hi! Would I be able to make this completely with coconut flour (instead of adding almond)? Can’t wait to try this. Thank you!! Unfortunately no, sorry! Coconut flour has a high absorbency rate and leaving out the almond flour would change the recipe. This bread looks seriously amazing Monique! Love the no added sugar and I have all the ingredients! Hate to ask, but have you tried making it as muffins? I’m thinking of doing this but not sure of the time change needed. If not, I’ll just stick with the loaf! You could try, but it’s best baked as a loaf! What can I substitute for the coconut flour? Tried this recipe for a work pitch in and received raving reviews 🙂 Most folks didn’t even know they were eating something much healthier for them than the other dessert options. This recipe will quickly become a favorite in our home! Ok the flavor is delicious but the texture leaves something to be desired… I baked it for 20 minutes and took them out to cool since the toothpick came out clean. But upon trying one, I found it super soggy and seemed underdone. So I put them back into the oven for another good 15 minutes but it only got slightly drier but no less mushy. I understand that baked goods made with coconut flour tend to be soggy but how can I tell if they are even done, or if that’s the way they’re supposed to be? Any insight would be much appreciated! It happens sometimes when the bananas have a higher water content. It’s happened to me before when making other sweet bread similar to this recipe (just did yesterday using canned butternut squash instead of bananas). If the batter is really runny next time just add a bit more flour or a little flax to make the batter less watery, You want it moist, but not too runny. Hope that helps. do you think this would work if I used all of almond flour instead of coconut flour? I’m not certain as I haven’t tried it! Coconut flour really helps to absorb liquid, so I have a feeling you’d need to use more almond flour. Just made this and it,was delicious also super easy to make .Will definitely be making this over and over again . I made these with hazelnut flour and they were amazing. After 33 days on whole 30, I baked. I’m adding these to my rotation. Thanks. These are excellent. I had 6 leftover bananas so I adjusted the recipe to reflect that. I made it as muffins with paper liners. They are almost soufflé line in texture while warm. Also used Ghirdelli bitter sweet chips because they were all I had. Very good recipe. Thanks for sharing! I just tried these in muffin tins and used flaxseed meal instead of coconut flour, and they are pretty life changing, soooooo chocolaty. Hi KIM, did you use same amount of flaxseed meal as coconut flour given in the recipe? I want to bake these as muffins too but don’t have coconut flour. At 350 for 23-25 min? Monique, thanx first of all for an amazing website 🙂 lovvve it! 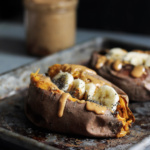 So, I made these & even added 1.5 scoops of banana cream Protein Powder, (for added protein as a post workout snack)..it was absolutely perfect in every way, soo yum!! Can’t wait to make this! I use a very similar base with the coconut and almond flour combination and it works great. Careful to others subbing pumpkin or butternut squash-it has a higher water content, so cut back a bit from what you would do with the bananas (I just made butternut squash bread and it came out soggy despite baking for like 45 mins). Also- I often add a 1/8 cup of plant protein powder or some ground flax (just a table spoon to my breads and my breads always turn out great). Excited to bake this tonight! Is the end result meant to be soft and gooey? It’s not what I’d call banana bread consistency. This is really good, thanks for posting! Because I’m not at home and didn’t have my usual coconut flour I substituted Orgran All purpose gluten free plain flour and left out one banana. I also cooked it 5 mins longer (but all ovens are different, and who knows if I just kept poking chocolate chips when I tested it). Anyway, it worked really nicely – the texture is beautiful! New to Paleo, but I’m loving it so far! Can’t wait to try this, thanks! Delicious new dessert for the little chocolate addicts in my family! They liked it better than their favorite cupcake from their favorite NYC bakery! Such a creative idea! The shapes you create will be soft like banana bread (rather than more dense like cookies) – in a sheet pan I would probably start with about 12-15 minutes and check them! These turned out awesome. So good! Definitely making this recipe again whenever I have overripe bananas just sitting on my counter! This is my go-to recipe if I have super ripe bananas sitting on my counter! I totally agree with Tony that they are SO GOOD if kept in the fridge. But I also love them just as much right out of the oven because melted chocolate. Doesn’t Enjoy Life chocolate contain sugar? I keep seeing it as an ingredient in Paleo recipes. I’ve been using Ghiradelli’s 100% cacao bar (found in the baking aisle). A little bitter, but the sweetness of the recipes I’ve used it in are enough to mask it for me. It does but it’s dairy-free unlike most chocolate chips & bars! Just did the survey – check! Printed this recipe and can’t wait to try it, yummo! Thank you for sharing your creativity and delicious recipes Monique. Hope you love this one!! I made these as mini muffins this morning to use up all my extra ripe bananas. I baked them for about 20 minutes and they turned out PERFECT. I prefer muffins over bread because I feel like I get to eat more. Not logical…but I’ll take it when it comes to chocolate and bananas! Thanks for the recipe. Used the Bob’s red Mill paleo flour mix. Less 2 bananas so 1 egg to replace. Turned out great!